The items we feature here from our Antique Vintage Children’s Clothing collection in our store are without a doubt a walk through yesteryear but also some of the most adorable and precious bits of old clothing for kids that you will ever see. Long before the days of mass production, things were homemade with love put into every stitch. And no child went to school and saw the same piece of clothing on anyone else!!! Can you imagine that? Find precious antique and vintage mittens, bibs, stockings, nightgowns, bonnets, dresses, slippers, rompers, pants, petticoats and much more. Feel free to click on any item to purchase! Another sweet baby bonnet from the early years of the 1920’s. 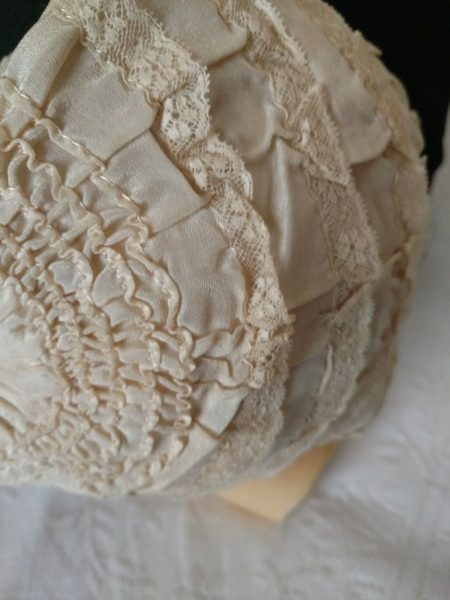 Made of a creamy silk fabric and rows of lace, this child’ s bonnet is a charmer. Crown of bonnet is made of five rows of ruching in a circular pattern. Three rows of narrow lace, plus an edging lace along the brim, further embellish the bonnet. Inside of bonnet is padded, then lined in silk. No bonnet ties, nor does there appear to have been any. 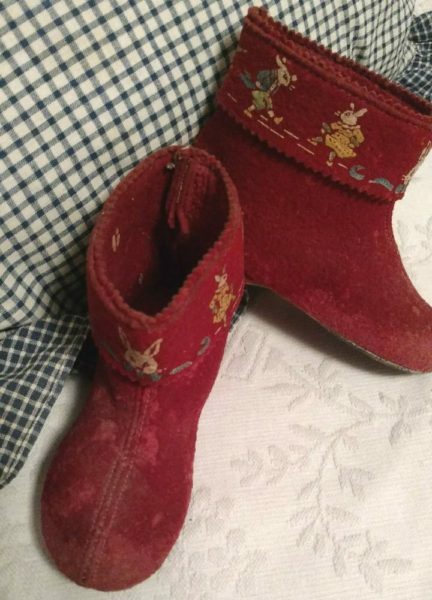 Vintage late 1940s or 1950s plush red wool felt children bedroom slippers. Featured are a dapper gentlemen coattail rabbit, who appears to be the character, Uncle Wiggily. He is dancing a jig with a girl, maybe his niece, Susie Littletail. The dressed rabbits are in a raised painted surface on the cuff of the slipper. Both sides. At the front of cuff, a head of a rabbit. Pinked edging at both the top and bottom edge of cuff. How adorable and never worn! 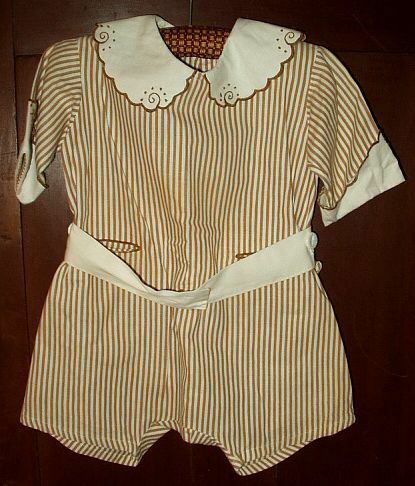 Toddler’s brown & white stripe rompers with embroidery collar & cuffs. Dates from the 1920’s – 1930’s. Belted in front with the same belt forming the waist line in back. Three large pearl buttons fasten the drop drawers at the back. Snap opening from the neckline to waist at the back. Cute scallop shaped cuffs & peter pan collar. How wonderful is this!! 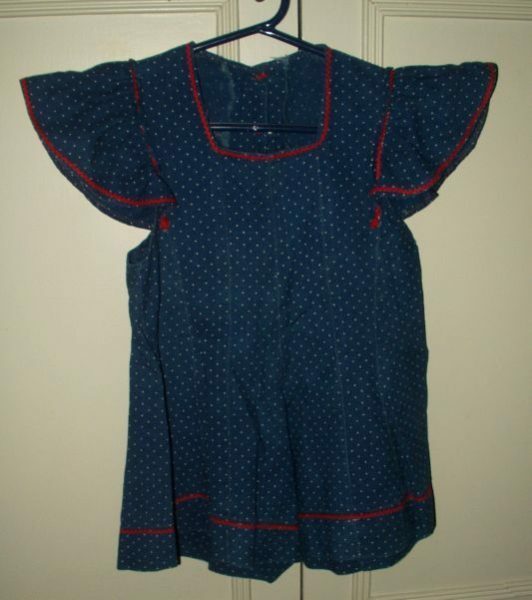 Little girl’s blue dot cotton fabric dress (culottes) with red rick rack trim. Ruffles across the shoulders. Square neckline in front. Buttons down the back with vintage red plastic buttons. This is such a cute style …gored & fitted in a pants-dress style. VERY VINTAGE!! Dating about 1940’s. Ever so sweet and dainty! No other words could describe this vintage baby sacque or bed jacket, dating from the later 1920’s or 1930’s. 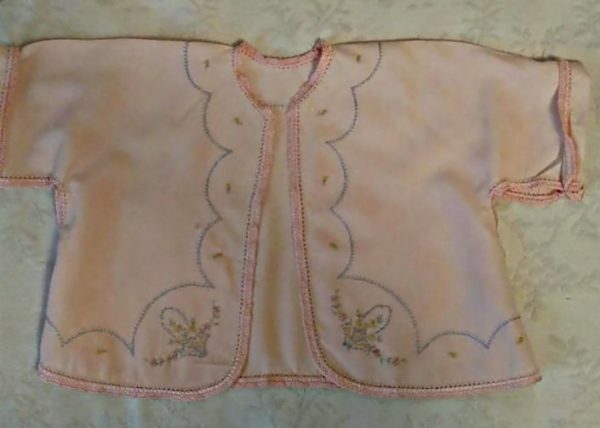 Made of a pink rayon, the jacket is embroidered with the small bouquets and tiny french knot flowers at the front opening and around the neck. A decorative scallop design is outlined on the front of jacket and neck with blue blanket stitch. Thick button hole stitch embellishes all the open edges and defines the cuffs. Sides of jacket and under sleeve seam are left open. Only attaching at the cuff, with a few stitches, to keep the baby’s arm in the sleeve. Sweet and dainty! 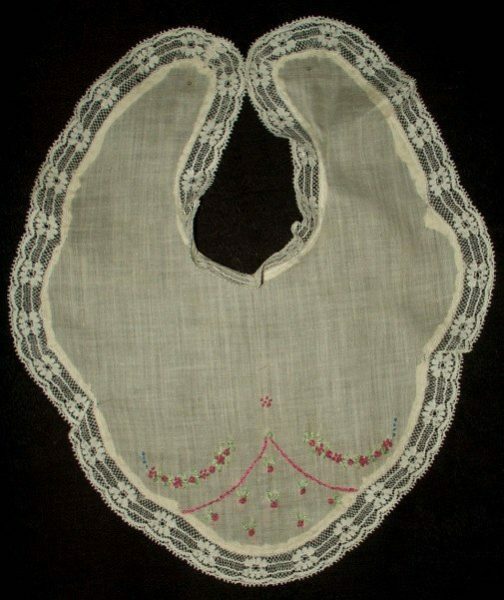 An adorable vintage hand embroidered baby bib dating from the early part of the 1900’s to 1930’s. Not only is the embroidery dainty so is the pretty lace and flowing outline of the bib.